Display your website in a zone by adding the website widget. Use any HTTPS website to view the website in the layout preview. Select your designated zone and enter the zones playlist by double clicking on the zone, or click 'Edit Zone Playlist'. 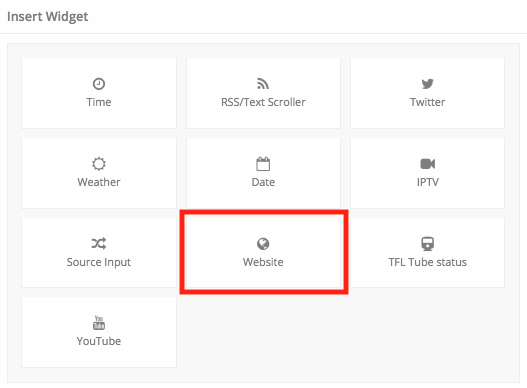 Click 'Widget' and select 'Website' to insert the website widget. Once the widget has been added to your zone you will be able to configure its settings. This can be done by selecting them from the playlist items summary or from the options on the right hand side once the pencil icon has been clicked. Website URL - This is the URL of the website we wish to show. Ensure you use a HTTPS website to view it in the layout preview. 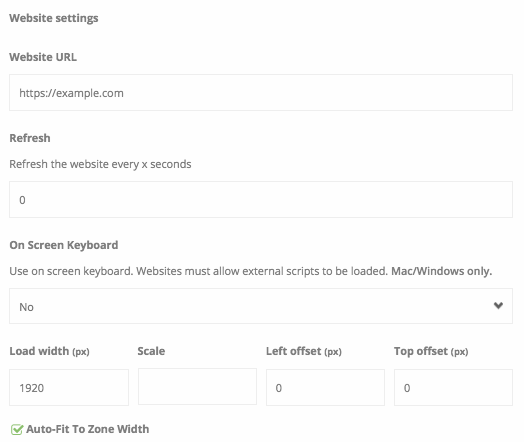 On Screen Keyboard - For Mac and Windows devices only you can choose wether to allow an on screen keyboard when needed for input fields on your website. Load Width (px) - By default this is set to 'Auto-Fit To Zone Width', meaning your website will load at the pixel width of the zone it is in. If you want to load the website at a specific pixel width, untick the 'Auto-Fit' button and enter the value in pixels. Top offset (px) - If you want to only show a specific section of a website this is where using the Top offset will come in. You can specify in pixels how far from the top of the website you wish to show in the zone. Once you are happy with your widget, click 'Save Changes' to go back to the zones playlist. If you have finished with the playlist, click 'Finish Editing Playlist' or the 'X' in the top right hand corner to go back to layout builder overview.